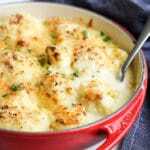 Cauliflower served in a creamy cheese sauce and baked until crispy on top. Can be enjoyed as a main dish, for lunch or dinner, or served as an accompaniment to a range of meals. Remove the base and outer leaves from the cauliflower, break into florets and wash. Drain the cauliflower in a colander and set aside. Melt butter in a saucepan and add the flour to form a roux, stir continuously for about 2 minutes. Add milk a little at a time, keep stirring/whisking continuously between each pour. Stir out any lumps before adding more milk. Continue adding the milk little by little until all the milk is incorporated and the sauce is thick and glossy. Place the cauliflower florets in a baking dish that is just large enough to hold the florets in one layer. I always use a mature cheddar to make a cheese sauce. I find it produces the best flavour. Any good melting cheese (e.g Colby, Tasty, Montery Jack) will also work but may not produce the same flavour. Seek out the most mature versions so that you don’t have to add so much to get the desired flavour. Breadcrumbs are optional, they give a lovely crispy topping and makes the dish look visually more appealing. Test the cauliflower with a knife. The knife should go in easily but the cauliflower should cleave to the knife and not fall apart. If you are making this dish ahead of time, to serve later in the day. Cover the dish and store in the refrigerator until ready to serve (do not add the breadcrumbs and cheese for top at this stage). Preheat oven to 180C / 355F. Cover the top with the cheese and breadcrumbs just before baking and bake for approx 30 minutes. The top should be brown and bubbling and piping hot in the centre. If cooking for a baby/ young toddler you can reduce the amount of cheese you add, to lower the sodium levels.